Maidenhead, U.K. – April 4, 2017 – Flexera Software, the company that’s reimagining the way software is bought, sold, managed & secured, announced today it is the first-in-industry to integrate IT Asset & Security Management for better vendor, financial & risk management – as well as operational efficiency and optimisation. Bringing together Software Asset Management (SAM) and Software Vulnerability Management technology is the initial step in this process, ultimately enhancing security for enterprises worldwide. To do that, Vulnerability Intelligence Manager can now leverage the core software and hardware inventory data from FlexNet Manager Suite to highlight enterprise risks, all while improving operational efficiency. Hackers use toolkits to exploit known vulnerabilities when launching or escalating attacks, leading to costly security breaches that can tarnish companies’ reputations. Vulnerability Intelligence Manager enables enterprises to identify vulnerabilities, and determine which ones to prioritise based on risk. According to Flexera’s Vulnerability Review 2017, 81 percent of all registered vulnerabilities had patches available on the day of disclosure. Enterprises can patch most vulnerabilities, the trick is knowing how to prioritise them based on criticality. Normalised software inventory data from Flexera’s SAM solution, FlexNet Manager Suite, can now be used to drive the Software Vulnerability Management process in Vulnerability Intelligence Manager. This helps streamline processes and improves collaboration between SAM and Security teams. Flexera’s SAM solution enables enterprises to gain visibility and control of IT assets, reduce ongoing software costs and maintain continuous license compliance. As part of this process, FlexNet Manager Suite helps companies discover and inventory their software assets, rationalise and consolidate their portfolio to reduce the software footprint, and upgrade or remove unsupported, end-of-life software. 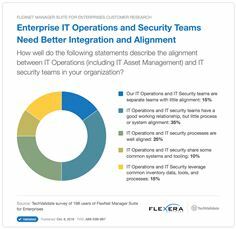 Indeed, according to Flexera’s State of the (Software) Estate: Waste & Risk Running Rampant in Enterprises Report, 64 percent of enterprises (up from 63 percent last year) faced a software audit within the past year. 46 percent (up from 38 percent last year) were audited more than once. And 23 percent (up from 19 percent last year) were audited three times or more. The integration announced today is the first in the industry that will enable organisations to leverage SAM processes and tools to enhance their security position and reduce the attack surface for hackers and cyber criminals. By integrating FlexNet Manager Suite and Vulnerability Intelligence Manager, Flexera Software addresses the urgent need in the marketplace to have a streamlined process for managing software vulnerabilities and mitigating security risks.